ASTRO-CLEAN 2001 A is a low foam liquid alkaline cleaner designed to remove process oils, gummy deposits of oil, grease, swarf and normal shop soils from machines, floors and other hard surfaces. Its primary application is for cleaning of machine tool sumps and surfaces, especially recirculating coolant systems. ASTRO-CLEAN 2001 D is a high performance, mild alkaline liquid cleaner designed primarily for use in spray washers and agitated tanks. It will remove shop soils, coolants and emulsifiable oils and is safe on all surfaces. It actively inhibits rust and white metal corrosion and conveniently splits out oils for safe disposal. ASTRO-CLEAN 2001 E is a biodegradable degreaser which contains natural citrus solvent, detergents and emulsifiers, replacing mineral spirits and chlorinated solvents for removal of oily soils. It is water extendable, safe on all metals and is effective from room temperature to 150 degrees F.
ASTRO-CLEAN 2001 FLOOR is a high performance water extendable liquid cleaner concentrate designed for use in powered scrubber floor cleaning systems and equipment. It may also be used for agitated cleaner tanks or for manual cleaning operations involving the toughest grime and process soils. ASTRO-KOTE 2001 C is a synthetic water based rust inhibitor designed to prevent rust on mild steel parts between machining operations. 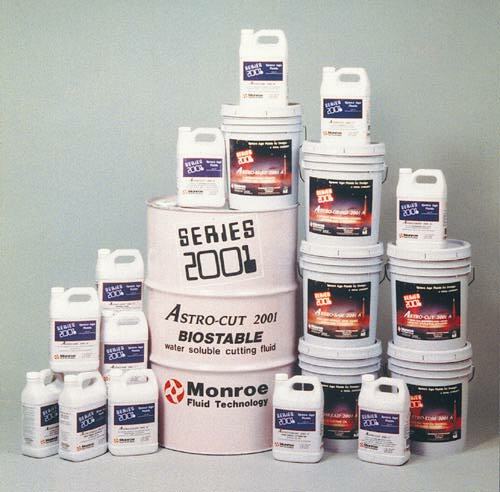 ASTRO-KOTE 2001 C may also be used as a supplementary rust inhibitor for use in water extendable metalworking fluids. This product does not leave any oily films. ASTRO-SAW 2001 A is a heavy duty oil-free coolant concentrate designed to replace soluble oil in production sawing of all metals except magnesium. ASTRO-SAW 2001 A contains a remarkable package of EP additives and corrosion inhibitors which offer outstanding performance without the mess and disposal concerns of soluble oil coolants. ASTRO-DRAW 2001 A is a heavy duty water soluble drawing oil formulated for use on heavy drawing and blanking operations on both ferrous and non-ferrous metals. COOL TOOL II is a high performance biodegradable tapping fluid that performs extremely well on ALL metals. COOL TOOL II does NOT contain chlorine, 1,1,1- trichloroethane nor any ozone depleting chemicals (ODCs). PRIME CUT is a heavy duty soluble oil concentrate containing a chlorinated additive for difficult machining operations. MONROE HD is a heavy-duty soluble water extendable sulfur-chlorinated metalworking coolant formulated to offer outstanding performance in difficult machining and grinding operations involving hard-to-work metals such as stainless steel, tool steels and high nickel alloys.